Basically, reaction definitions interpret the way of transformation of reactants to products; however, if you have a product (or products) and a reaction definition, you can run a "reversed" reaction to make its reactant known. As in every case when working with reaction definitions, please follow the order of reactant or product definitions as it is depicted in the given reaction equation. Taking the above example, the reaction equation depicts two reactants; the first one is a diene, and the second one is an alkene. The reaction of these two reactants leads to only one product. When you want to run the onward reaction of this reaction equation, you need to specify two reactants in the following order: first molecule is a diene; second molecule is an alkene. 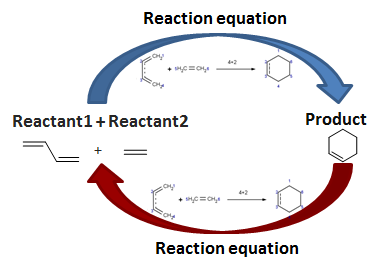 Running the reaction equation in reversed mode, you need to specify only one molecule as input or "reactant", and you will get two "products", a diene and an alkene.